Description: Being the daughter of a fair queen takes up a whole princess beauty routine to get the perfect look. Join Pure Princess in the royal salon for a spectacular makeover. 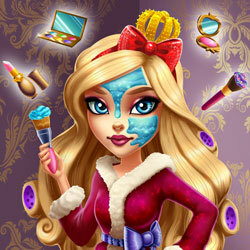 Find out what creams and masks our princess uses and then create a new look with colorful makeup palettes. Dress her up in couture outfit and she'll be ready for another eventful day in her magical kingdom.